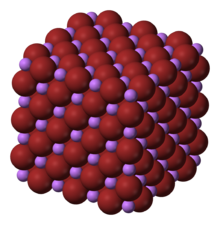 Lithium bromide (LiBr) is a chemical compound of lithium and bromine. Its extreme hygroscopic character makes LiBr useful as a desiccant in certain air conditioning systems. LiBr is prepared by treatment of lithium carbonate with hydrobromic acid. The salt forms several crystalline hydrates, unlike the other alkali metal bromides. The anhydrous salt forms cubic crystals similar to common salt (sodium chloride). Lithium hydroxide and hydrobromic acid (aqueous solution of hydrogen bromide) will precipitate lithium bromide in the presence of water. 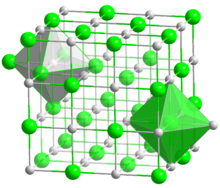 Lithium bromide is used in air-conditioning systems as desiccant. Lithium bromide is used as a salt in absorption chilling along with water (see absorption refrigerator). Otherwise the salt is useful as a reagent in organic synthesis. For example, it reversibly forms adducts with some pharmaceuticals. Lithium bromide was used as a sedative, beginning in the early 1900s, but it fell into disfavor in the 1940s when some heart patients died after using it as a salt substitute. Like lithium carbonate and lithium chloride, it was used as treatment for bipolar disorder. Doses as low as 225 mg/day of LiBr can lead to bromism. Lithium salts are psychoactive and somewhat corrosive. Heat is quickly generated when lithium bromide is dissolved into water because it has a negative enthalpy of solution. ^ Chambers, Michael. "ChemIDplus - 7550-35-8 - AMXOYNBUYSYVKV-UHFFFAOYSA-M - Lithium bromide - Similar structures search, synonyms, formulas, resource links, and other chemical information". chem.sis.nlm.nih.gov. Retrieved 3 April 2018. ^ a b Ulrich Wietelmann, Richard J. Bauer "Lithium and Lithium Compounds" in Ullmann's Encyclopedia of Industrial Chemistry 2005, Wiley-VCH: Weinheim. ^ "Bipolar Disorder: Treatment and Care". webmd.com. Retrieved 3 April 2018. "A PDF file from GFS Chemicals, a supplier of lithium bromide" (PDF). Retrieved 2005-09-15.